This is a Professional 1080P HD Pan Tilt Zoom Camera is our latest generation of PTZ Cameras with advanced image sensors that provide unparalleled video quality thanks to its 2MP Sony Starvis Image Sensor. The Sony sensor combined with Starlight technology that dynamically adjusts the electronic shutter speed allow the camera to see in color in very low light (0.005 Lux) and in black & white (0.0005 Lux) in almost no light without the need for infrared. Ambient light or moonlight works wonders for this camera. Without having infrared LEDs that are shining, it can be used as a discrete camera for night time surveillance for perimeter security without alerting the intruder of the camera's presence. The camera also has True Wide Dynamic Range (WDR) to help minimize glare from different lighting levels in the foreground and background. 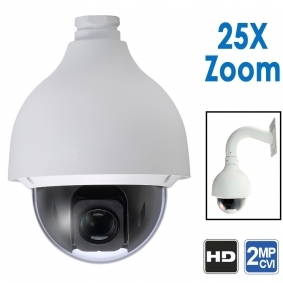 This 2MP PTZ camera is IP67 weather proof rated and is suitable for outdoor/indoor use. This camera has a 4.8-120mm Optical Zoom Lens; that is 25X optical zoom and 16X digital zoom. When zoomed in all the way the camera allows subject identification up to 300ft away in daylight. * If you have the camera set at a wider angle of view, the 1080P resolution allows digital zoom up to 25ft away from the focal point for facial identification. Depending on how you set the camera's optical zoom, you will get different max distances for facial capture. It is a high speed dome camera that can do continuous 360 degree pan, and can do a 180 degree tilt with auto-flip. Since it is a professional PTZ camera, it also allows the user to set up to 300 presets, and up to 5 patterns or 8 tour sets; programming the PTZ camera for tour setup is very easy when used with our HDCVI DVRs. If you're looking for night vision, then be sure to take a look at the 1080P HD Night Vision PTZ 25X Zoom which is a similar outdoor 25X PTZ with added night vision. How do you wire this camera? Wiring this camera is much easier compared to traditional analog PTZ cameras. 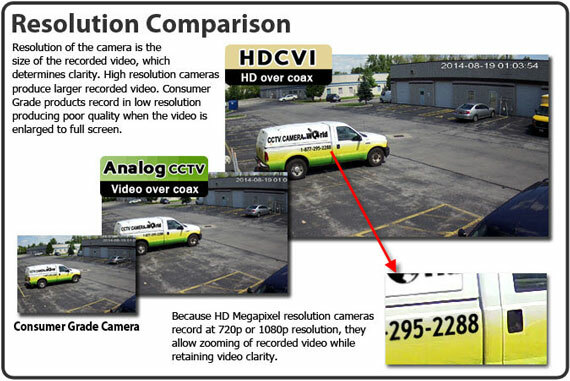 HDCVI technology allows the user to run cameras up to 1600ft without losing video quality, and simplifies wiring of PTZ cameras. You no longer have to run multiple wires to connect a PTZ camera to the DVR. Simply power the camera using the included power supply, and run one good RG59U coax cable (that's the kind taken from a spool) from the camera to the DVR. That one coax cable can carry video and PTZ data signals over to a HDCVI DVR. How do you control this HDCVI PTZ camera? In HD video output mode, HD over Coax PTZ cameras need to be connected to a DVR for decoding and display of the HD video signal, and for PTZ controls commands to be sent over Coax using the HDCVI protocol. Once connected to our Security DVRs that feature HDCVI PTZ control, controlling the camera is simple. With the click of a mouse on the DVR's menu you can control zoom and position of the camera. Further, there is a 3D targeting feature in our DVRs and PTZ cameras that makes it easy to zoom in on an area by simply drawing a rectangle with your mouse on the DVR and the camera will zoom in to the location you select. You can even use this 3D targeting method using our friendly PC/Mac software when viewing security cameras over the internet using a computer. Once your DVR is connected to the web, you can also control the camera using our mobile Apps for iOS and Android, a Web Browser on the computer, or the Windows/Mac client software for the computer. Will this camera work with my old analog DVR? This PTZ camera offers user selectable video output at HD 1080P or analog CVBS which is compatible with standard definition displays and DVRs. If you would like to control the camera using a joystick controller, you will need our PTZ joystick controller that offers compatible protocols to control the camera in over RS485. Can I connect this camera directly to a monitor without going through any kind of processor or DVR. If so which of you monitors is compatible?